During the Second World War, the nation of Sweden, feeling under threat during the expanding conflict, ordered Saab to develop an advanced front-line fighter aircraft. The corresponding aircraft was an unorthodox twin-boom pusher configuration fighter aircraft, featuring a low-mounted wing, a tricycle landing gear arrangement, and was furnished with heavy forward-firing armament. Throughout 1945, several different options were explored with the intention of improving the 21's performance, leading to SAAB working on producing a version of the 21 that would harness jet propulsion. On 10 March 1947, the maiden flight of the 21R occurred. During 1947, at the direction of the Swedish Air Force, SAAB began converting the service's piston-engined J 21s to use jet propulsion instead, which required each aircraft to receive extensive modifications. A production run of 124 aircraft was originally envisaged, including four prototypes, however, the type was instead mainly used as a fighter-aircraft and orders were almost halved to 64 aircraft. As a fighter, its service designation in the Swedish Air Force was J 21R, and saw service in the late 1940s and early 1950s before it was replaced by a new generation of fighters that had been designed from the onset to harness jet propulsion, such as the de Havilland Vampire and the Saab 29 Tunnan. During the early stages of the Second World War, the nation of Sweden was concerned that its neutrality and its independence could come under threat by one or more of the belligerent powers, enacted a series of emergency measures to increase its military's combat preparedness and deterrence value against would-be aggressors. During the period of 1939–1941, the Swedish Air Force committed itself to a major expansion programme, which included the procurement of large number of foreign-sourced and indigenously developed fighters. As a consequence of the raging conflict across Europe, there were not many nations who possessed the available production capacity or a willingness to prioritise the supply of modern fighter aircraft to Sweden, being a relatively small neutral country; while Sweden's own domestic production capability had been deemed to be insufficient until at least 1943, it was recognised that it would be necessary for the nation to build up its own first-rate designs to meet its needs. During 1941, in response to demand from the Swedish Air Force, the Swedish aviation company SAAB commenced work upon bringing a radical new fighter design. The company envisioned an unorthodox twin-boom pusher configuration fighter aircraft, featuring a low-mounted wing, a tricycle landing gear arrangement, and was furnished with heavy forward-firing armament. It was powered by a piston engine, specifically a localised version of Germany's new Daimler-Benz DB 605B inline engine, which was refined and built by Swedish firm Svenska Flygmotor AB for the programme. 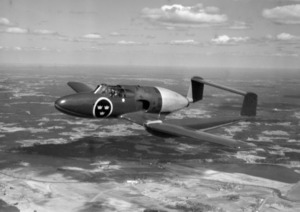 Designated as the J 21 by the Swedish Air Force, the proposal was accepted and authorised to proceed to the prototype stage; on 30 July 1943, the first J 21 prototype, powered by the 605B engine, conducted its maiden flight, flown by SAAB test pilot Claes Smith. Throughout 1945, several different options were explored with the intention of improving the 21's performance. Many of these speculative upgrades involved the substitution of the 605B engine with a more powerful alternative powerplant. During the first half of the year, the company had planned out a variant of the fighter that would be powered by a Rolls-Royce Griffon engine, capable of producing a maximum of 2,000hp; according to estimate, the Griffon would have provided the 21 with a projected top speed of 416mph. Other projects, such as the studied SAAB 27, were intended to use the Griffon as well; however, by the end of the year, all work on piston-engine design had been abandoned by the company in favour of another means of improvement. In parallel with the piston-engine studies, SAAB and several other Swedish companies had been evaluating the options for the adoption of an innovative, brand new type of engine - the jet engine. Two early studies, designated as RX 1 and RX 2, had been examined, both of which being twin-boom aircraft similar to the 21. Recognising enthusiasm on the part of the Swedish Air Force for a jet-powered aircraft to be made available, during late 1945, SAAB resolved itself to producing a version of the 21 that would harness jet propulsion. As such, Saab launched a design study with the aim of best determining how to power the J 21A with a jet engine. It was viewed as being highly desirable to 'catch up' with recent innovations in the field of fighter development, which was visibly advancing rapidly in nations such as the United Kingdom where, among others, British aircraft manufacturer de Havilland had already placed its own jet fighter, the de Havilland Vampire, into production. For some months after starting work during late 1945, the design study proceeded without focusing on a specific engine, the selection of which was an open question for some time. As SAAB continued its work on the initiative, it became possible for Sweden to purchase the "Goblin 2", a turbojet engine, directly from de Havilland Engine Company, along with the license to manufacture it in Sweden. Acquired as per this manner, the engine became the first jet engine to be used by the Swedish Air Force, who designated it as the RM1. On 10 March 1947, the maiden flight of Saab's first jet aircraft, being a converted J 21, outfitted with a single Goblin 2 engine, took place. The results of the subsequent flight test programme was largely viewed as satisfactory. During 1947, at the direction of the Swedish Air Force, SAAB began to receive the service's piston-engined J 21s for the purpose of converting them to jet propulsion. This conversion work involved an extensive rebuilding programme, requiring each aircraft to be extensively modified. In all, in excess of 50 per cent of the airframe, tailplane and wing was changed and, most significantly, each of the fighters was furnished with a single British-sourced de Havilland Goblin turbojet engine, which took the place of the DB 605B and propeller unit. The resulting jet-propelled fighter was adopted by the Swedish Air Force and became the service's first jet aircraft. In light of its extensive changes and to differentiate them from its predecessors, rebuilt 21s were assigned the designation of J 21R. Many of this changes had to be made in order to accommodate the Goblin engine, which had considerably different properties and requirements than the earlier DB 605B unit. In order to sufficiently address the position of the new engine's exhaust, the stabilizer of the tailplane had to be raised from its former position, effectively requiring the tail section to be redesigned. Additionally, to sufficiently feed the hungry turbojet engine, the fighter's fuel volume was increased significantly via the installation of additional fuel tanks within the middle section of the wing and a pair of large wingtip tanks. At the same time, various measures to improve the fighter's aerodynamic properties were implemented during the rebuild process, leading to the adoption of curved glass in the forward section of the cockpit canopy, while the leading edge of the wing also received modifications. It was decided to implement air brakes in the form of an additional flap located on the outer wing's trailing edge. The ejection seat, which was a relatively new innovation, received various alterations and improvements that enabled it to correctly eject during higher speed flight. The attack version, designated as the A 21R, saw the addition of 14.5 cm and 18 cm ground attack rockets, which could be installed underneath the middle wing. Furthermore, an alternative external gun pod called "Paddan", meaning the toad, could also be installed underneath the middle wing in place of the rockets. Paddan contained eight 8 mm ksp m/22 machine guns with 800 rounds of ammunition per gun. The fire control system of the plane allowed it to fire all guns and all its rockets or gunpod at the same time. This was an interesting "sensation" for the pilot as it made the airplane loose a lot air speed and almost stop mid air. A production of 124 planes was planned originally, including four prototypes. When experience with the type as a fighter was gained with the F 10 wing it was concluded that all aircraft needed to be changed to attack aircraft. The production series was then reduced to 64 aircraft. Of these, 34 fighters were designated as the J 21RA (later re designated to A 21RA), powered by the Goblin 2 engine, known as the RM1 in Sweden, which was capable of generating a maximum of 1360kp of thrust. The other 30 were of the A 21RB standard, which was powered by a Swedish-made Goblin 3 engine, designated in Swedish Air Force service as the RM1A, capable of producing 1500kp of thrust. The first prototype Saab 21R first flew on 10 March 1947, almost 2 years after the Second World War. The aircraft first entered service with F 10 in August 1950. Although the type was originally intended as a fighter aircraft, a newly developed fighter, the Saab J 29 first flew in October 1948, the number to be produced was halved from 120 to 60, and eventually all 21Rs were converted to attack aircraft as A 21RA or the A 21RB depending on the engine type. First production series, powered by British-built engines, 34 built in 1950 (including four prototypes), retired in 1953. Second production series, powered by Swedish-built engines, 30 built between 1950 and 1952, retired in 1956. No original planes were preserved after they were taken out of service. In the 1990s a group of volunteers took one of the remaining unairworthy Saab 21 airframes and rebuilt it to a 21R for display at the Swedish Air Force Museum. ^ Gunston 1995, p. 472. ^ a b Cattaneo 1967, pp. 10-12. ^ "J 11 – Fiat C.R. 42 (1940–1945)." Archived 5 February 2007 at the Wayback Machine Avrosys.nu. Retrieved: 22 July 2009. ^ Widfeldt 1966, p. 3. ^ Widfeldt 1966, p. 4. ^ Widfeldt 1966, pp. 3-4. ^ a b Widfeldt 1966, p. 7. ^ Widfeldt 1966, pp. 7-8. ^ Widfeldt 1966, p. 8. ^ a b Billing 1983, p. 22. ^ Erichs et al. 1988, p. 23. ^ Widfeldt 1966, p. 9. Andersson, Hans G. Saab Aircraft since 1937, 1st ed. London: Putnam, 1989. ISBN 0-85177-831-3. Billing, Peter. "Saab's Jet Debutant". Air Enthusiast, Twenty-three, December 1983 – March 1984, pp. 20–30. Bromley, UK: Fine Scroll. ISSN 0143-5450. Cattaneo, Gianni. The Fiat CR.42 (Aircraft in Profile number 170). Leatherhead, Surrey, UK: Profile Publications Ltd., 1967. No ISBN. Erichs, Rolph, Kai Hammerich, Gudmund Rapp et al. The Saab-Scania Story. Stockholm: Streiffert & Co., 1988. ISBN 91-7886-014-8. Sharpe, Michael. Attack and Interceptor Jets. London: Friedman/Fairfax Publishers, 1999. ISBN 1-58663-301-5. Widfeldt, Bo. The Saab 21 A & R (Aircraft in Profile number 138). Leatherhead, Surrey, UK: Profile Publications, 1966. Wikimedia Commons has media related to Saab J21R. This page was last edited on 18 March 2019, at 23:45 (UTC).